Years of expertise and cooperation has brought about this space lighting that concentrates the best lighting technology available into the slimmest panel possible. Can be fitted with Fluorescent or LED bulbs. 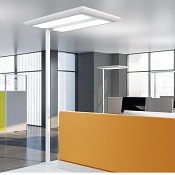 The most sophisticated version is fitted with a daylight or presence sensor diffusing light that is perfectly adjusted to every different level of light through out the day. 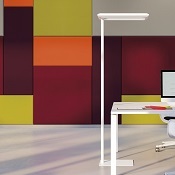 Versions include floor standing and desk mounted.